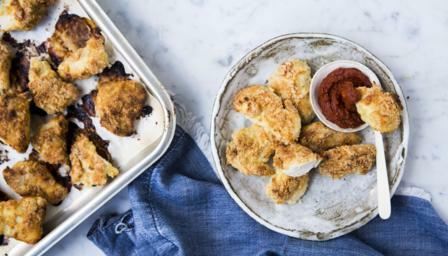 These gluten-free chicken nuggets have a crisp coating thanks to ground almonds. Try them with throw-together BBQ sauce. Each nugget with a little BBQ sauce provides 77 kcal, 6.7g protein, 0.8g carbohydrate (of which 0.7g sugars), 5g fat (of which 1g saturates), 0.1g fibre and 0.3g salt. Preheat the oven to 200C/180C Fan/Gas 6. Line a baking tray with baking parchment. Pour the ground almonds into a bowl and stir in the seasoning. Beat the eggs in a separate bowl. Season the chicken pieces all over with the salt and pepper. Dip each chicken piece first in the egg, then roll in the almonds until completely covered. Arrange the nuggets on the prepared baking tray. Melt the butter in a small saucepan over a low heat. Drizzle the melted butter over the nuggets. Bake in the oven for 18-20 minutes, turning halfway through cooking, until cooked through and golden-brown. Meanwhile, for the BBQ sauce, whisk together the tomato purée, melted butter and balsamic vinegar until well combined. Season with salt, pepper and smoked paprika. Transfer the BBQ sauce to a sterilised, airtight jar and chill in the fridge until needed. It will keep in a sealed jar for up to 1 week.